Yikes! I think I dug myself a hole. 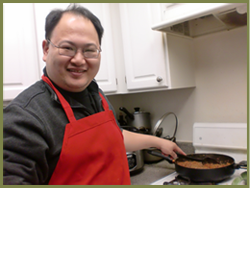 Earlier this year, Kim of Cravings of a Lunatic featured me in her series, Burning Down the Kitchen where she replicated the Bucatini All'Amatriciana I originally published more than two years ago. I returned the favor about a month later when she became my inaugural blogger for my Adding Some Class with... series. In both cases, a major theme is that I like to challenge myself in the food I prepare. Well when I volunteered to do a guest post for Kim, I knew I had to prove I had to "walk the walk" so-to-speak since we talked the talk. It's interesting how my strategies have evolved over the course of the last two years. I started out profiling unusual cooking methods for the home cook and making food from scratch but I'm finding recently that food pairing and dish composition more satisfying than straight execution. In all honesty, it took me several days to decide upon the components in this dish and I couldn't do I without my copy of The Flavor Bible. Ultimately, I had some execution failures which I will go further into detail at Kim's but first please reach her at Facebook, G+, Pinterest, StumbleUpon, twitter on top of her Kiss My Smoke Facebook and Pinterest pages if you haven't already. Live up to the reputation I've built for myself. I would categorize Mrs. Stuntman and I as infrequent drinkers. We might have a glass of wine with dinner if we're having friends over for dinner or on a special occasion such as anniversaries or birthdays but that's about it. I might drink a beer twice per year, maybe? I don't have any medical or moral objections to it. I just don't crave it very often. I do buy a lot of wine but it's the cheap stuff I use for cooking. It is for this reason that I was curious when found an open, half-empty bottle of vodka recently when I was cleaning the kitchen. I vaguely remember using it in a dish but I couldn't tell you when or from what dish. Not wanting to waste food, I went looking for dishes that highlighted the ingredient and zeroed in on a pasta favorite. This dish was prepared by Chef Mario Batali on The Chew. 1. Boil the pasta: Bring a large pot of well-salted water to a boil over high heat. Add the penne and continue to boil for two minutes less than the box instructs. Reserve 1 cup of pasta water, then drain and set aside if the sauce isn't finished yet. 2. Prepare the sauce: While the pasta boils, render the bacon in a large sauté pan over medium heat until slightly crisp, approximately 7 to 10 minutes. Add in the garlic and tomato paste and cook until the tomato paste turns a darker color and the garlic is fragrant. Add the vodka to deglaze and stir to blend the flavors. Then add the heavy cream and nutmeg and simmer for a minute or two. Add in the cooked penne and toss to coat, using the reserved pasta water to adjust the sauce and season with salt, if necessary. 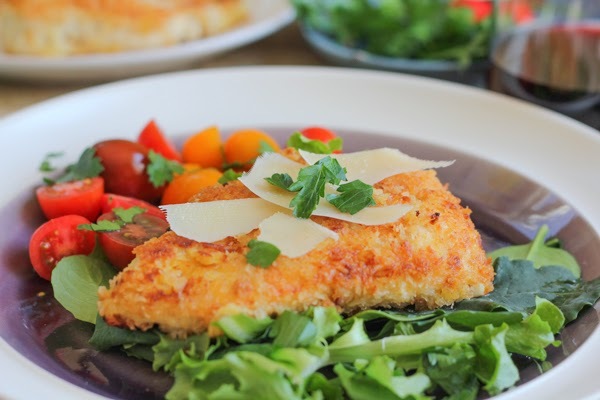 Serve in warmed bowls garnished with grated Parm and parsley. I hope everybody's St. Patrick's Day was filled with green food, laughter and friends. Today I present my second installment of my Adding Some Class with... series. For the month of March, I'd like to introduce you to Alice of Hip Foodie Mom. 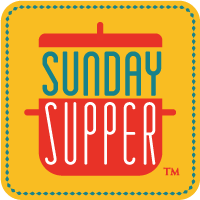 Alice and I crossed paths when we both did posts for the #SundaySupper Movement, but once I checked out her blog, it was love at first sight-quite literally. One of the things I admire about Alice is the pictures of the dishes she puts up on her blog, which will be on full display below. She also writes about parenting two small daughters addition to her food. Speaking of her food, I noticed that she isn't afraid to try different things, choosing to prepare different types of dishes instead of focusing on one or two areas such as baking or seafood. Some of my favorites are her Sunday Pot Roast with Risotto Cakes, her different sushi rolls and her Blueberry, Lemon and Thyme Ice Cream. If you don't know Alice yet, you should. In addition to her blog I noted above, like her on facebook, add her to your G+ circles, in addition to following her on twitter, pinterest, Instagram, and BlogLovin'. 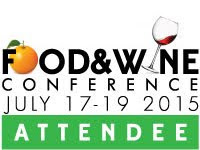 What an honor it is to be here today! 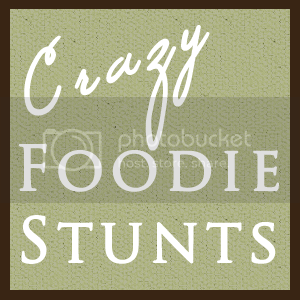 Before I get to my recipe I wanted to share a few words about The Foodie Stuntman. I met DB through Sunday Supper. I have high admiration for his recipes and the cooking techniques he shares and all the thought that goes into selecting recipes to challenge himself and to share with you all. It’s not easy running a food blog. 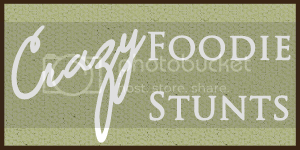 Running and writing a food blog amongst, what feels like, a community that’s maybe almost 98% women. It can’t be easy and again, I really admire his ability to be able to hang with the women. And all of this would probably mean nothing if DB couldn’t cook. But homeboy can. With dishes like Paglia e fieno, Tea Smoked Roasted Chicken and his Pan Seared Scallops with Lemon-Basil Beurre Blanc, Pancetta, Apple and Fennel! I am continually in awe. So I wanted to cook something special today. Something special to also celebrate the official day of spring because well, I've been waiting for this day for what feels like months and months. Spring is finally here my friends! And for this girl (this girl living in Madison, Wisconsin) I cannot wait for all this snow to melt and to be able to run or take a walk outside and the temperature to be higher than 20 degrees. To take my daughters to the park! To wear shorts and flip-flops! OK, I might be getting ahead of myself here. . I also have big landscaping plans for my front lawn because right now, it's a big mess. So, in honor and celebration of the official first day of spring, which is tomorrow, I made Spicy Chicken Milanese! This is typically a summer dish but I could not resist these perfect, little beautiful grape tomatoes. 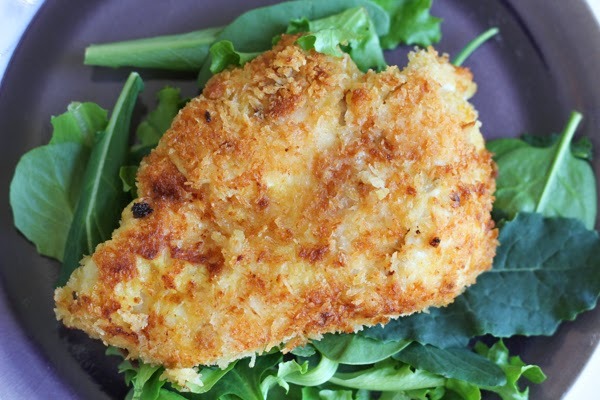 This dish is extremely easy to make, packed with flavor and perfect for a weeknight meal. 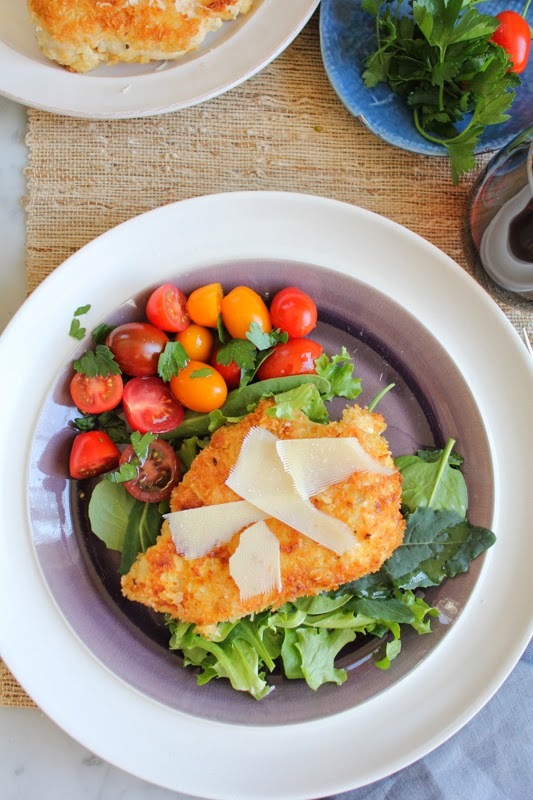 Crunchy, juicy breaded chicken topped with a juicy, colorful tomato salad and salty slivers of Parmesan cheese. I hope you enjoy this recipe, cheers! Method: Using a large mixing bowl, toss the tomatoes, lemon juice and parsley with about 1 tablespoon of olive oil and season with salt and pepper. Set aside. I like to do this step first so the flavors can begin to come together. Next, you are going to set up a dredging station. Using a medium sized, shallow dish, beat the eggs with the Dijon mustard, cayenne and red pepper flakes and season with salt and pepper. Pour the panko into another, separate medium sized, shallow dish. 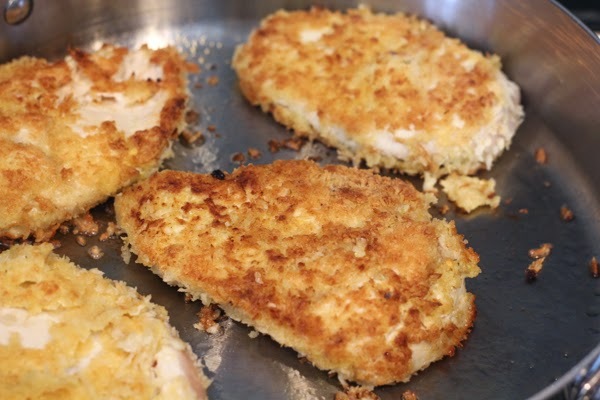 Dip the chicken into the egg mixture, then dredge in the panko; pressing gently to help it adhere. Using a large skillet over medium-high heat, heat about 1/3 cup of the olive oil until shimmering. Add the chicken and cook over moderately high heat, turning once or twice, until browned and cooked throughout, for about 8-10 minutes, depending on the thickness of your chicken. 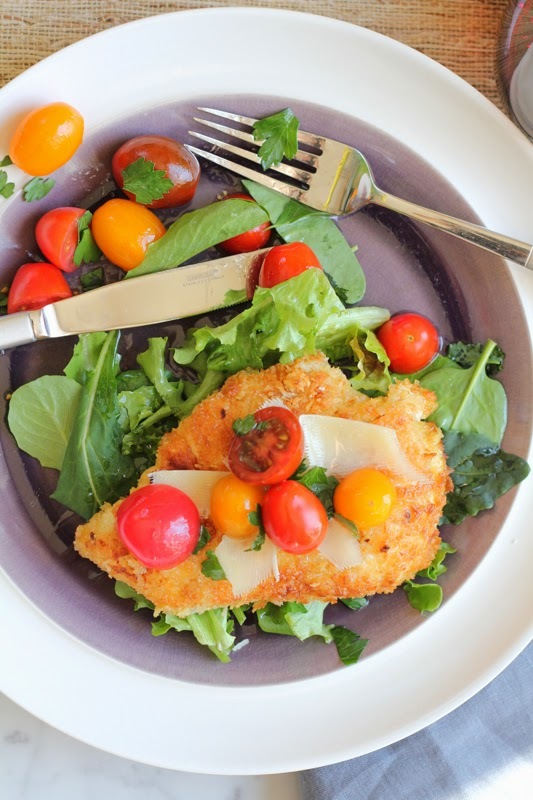 Transfer the chicken to plates that have fresh greens and/or arugula on them. Please the chicken on top. 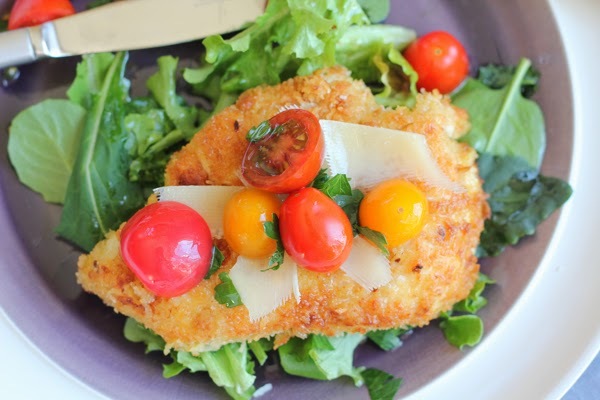 Spoon the tomatoes and parsley over the chicken and garnish with the Parmesan cheese. Drizzle a little more extra virgin olive oil if desired. Serve immediately and enjoy! It's almost criminal how easy Alice's dish is, given it's beauty. I also love how the colors pop off of the plate. I just wish I could have been there to eat this dish the night she prepared it. Thanks to Alice for being a guest here! For my regular readers, I apologize I've ignored you in the couple of weeks, but I have some exciting things planned in the near future. Until then, Monday we celebrate the Irish with St. Patrick's Day. Within the week spring will be upon us, so it's timely that the team at #SundaySupper Movement has decided to profile green dishes. Over the course of writing this blog, I've found that I've become a fan of flavored pastas. In the past I've prepared herb-speckled pasta, chocolate pasta, and purple pasta not once, but twice. So it was a surprise that I had overlooked this dish in a cookbook I've had for over a year until now. According to Google, paglia e fieno directly translates to straw and hay and got it's name because the regular fettuccine and the spinach fettuccine mimic straw and hay respectively. According to Chef Bastianich, the dish is a restaurant staple but I don't remember seeing it on any Italian restaurant menu that I've patronized (which makes me want to re-evaluate the authenticity of the Italian restaurants I've given my hard earned cash to, but I digress). What makes this a weeknight meal? Quite simply, the mise en place. Prepare some onions and measure out other ingredients and you're done. 10 minutes, tops. Restaurant style elegance on a weeknight. Adapted from page 77 (with a picture of the dish on page 76) of Lidia's Favorite Recipes by Lidia Matticchio Bastianich and Tanya Bastianich Manuali. 1. Bring a large pot of well salted water to a boil over high heat. Drop the fettuccine into the water and boil until just shy of al dente (usually 2 to 3 minutes less than the box instructions. 2. Heat the oil to a large skillet over medium heat. Once hot, add the scallions and sweat until wilted, approximately 2 minutes. Add the peas to the scallions until tender, an additional approximate 3 minutes. Add the prosciutto and cook until browned slightly, approximately 2 minutes. Deglaze with chicken stock and bring to a boil, reduce heat to a simmer and reduce the liquid by half. Then add the cream and simmer until thickened, approximately 2 to 3 minutes. Drain the pasta, then toss with the sauce and simmer for a minute or two to blend the flavors. Serve in warmed bowls and garnish with Parmigiano. I had to alter the method slightly because I had dried traditional pasta and fresh store-bought spinach pasta so I added the spinach pasta later. I plan on revisiting the topic of spinach pasta later, but not appropriate for a weeknight.